Ken Nedimyer, left, and Kevin Gaines of the Coral Restoration Foundation with young colonies of Elkhorn Coral, Acropora palmata, to be outplanted to the wreck-damaged and badly degraded Molasses Reef in the Florida Keys. On the day in 1996 that changed Ken Nedimyer’s life, he was a dawn-to-dusk live-rock farmer and reef-fish collector in the Upper and Middle Keys, little known outside the small marine livestock–harvesting community in Florida where he was respected for his hard work and strong sense of environmental ethics. His Sea Life, Inc. business kept in intimate touch with nature, but it hardly promised to bring him fame or fortune. On this day, in 30 feet of water off Tavernier, Nedimyer was gliding slowly over his neat rows of aquacultured rock, which had been collected dry from an upland quarry on Grand Bahama Island and from the Florida mainland. After two years submerged on the sandy bottom, the porous “Miami Oolite” limestone rock was nicely encrusted with coralline algae, green macroalgae, sponges, bryozoans, and other invertebrate life. Thinking about how the crop of rock was almost ready for harvest, Nedimyer was suddenly stopped in his watery tracks by something he had never seen here before: settled recruit colonies of Acropora cervicornis, Caribbean Staghorn Coral. Once a dominant stony coral in Florida and Caribbean waters, this species, along with Elkhorn Coral, Acropora palmata, had become increasingly rare and would soon be protected under the U.S. Endangered Species Act. Collecting or selling these species would be forbidden within a year or two, although neither had ever sold in the aquarium trade. Nedimyer left the young Staghorns untouched, but the notion that this important reef-building species was reproducing itself in his backyard became a preoccupation. Could this phenomenon be used to help repopulate barren reefs that had lost their Acropora cover to storms, pollution, weather events, and disease? Such praise makes Ken Nedimyer uncomfortable, but it is well deserved. 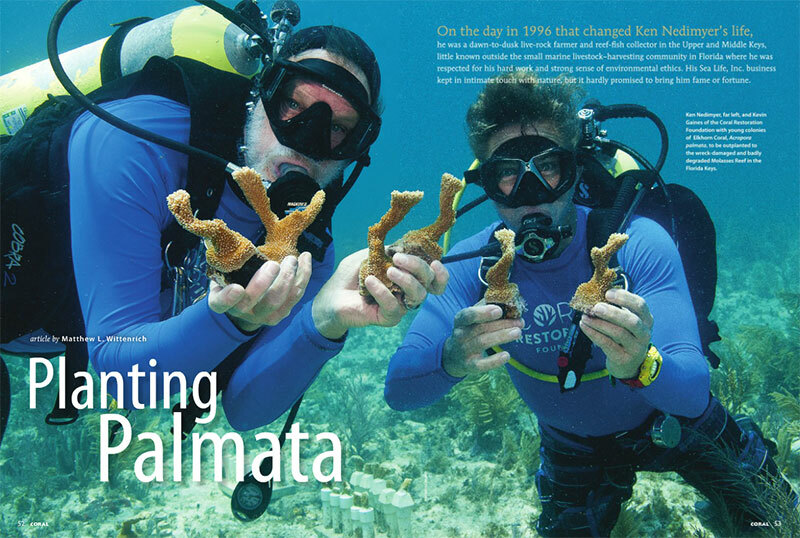 Over the last decade Nedimyer and his crew have outplanted more than 3,500 corals to help rebuild the reefs of the Florida Keys, established several ocean nurseries growing more than 25,000 corals, and created perhaps the greatest working example of reef restoration anywhere in the world. Their model has triggered an onslaught of successors and collaborators such as Nova Southeastern University, the University of Miami, Mote Marine Lab, The Florida Aquarium, and The Nature Conservancy, among others. READ the full article in CORAL Magazine. Purchase a hard copy back issue of the September/October 2012 CORAL Magazine here. Opening spread featuring Ken Nedimyer and Kevin Gaines copyright Tim Grollimund.